By learning the protocol involved in displaying national ensigns and developing an understanding of one of the world’s oldest and most globally-recognized form of communication — the International Code of Signals — boaters can enhance their boating experience and further their nautical knowledge. While the practice of many nautical traditions and practices have gone the way of the dial telephone, following any nautical tradition, no matter how outdated or impractical, can make the recreational boating experience more fun and interesting, especially those involving flags. In the United States, a registered or documented vessel of any size is entitled to fly the U.S. national flag. In the nautical world, any country’s national flag is typically referred to as the national ensign and is flown from a vessel’s stern to indicate its nationality, which has served that very practical purpose for centuries and continues today. In place of the national ensign, recreational boats can fly the U.S. Yacht Ensign (13 stars with a fouled anchor in the blue field). This ensign was designed in 1848 at the request of the Secretary of the Navy to distinguish private yachts from commercial vessels and warships. At the time of its inception and for several years following, the yacht ensign served a practical and money-saving purpose: it relieved the vessel flying the ensign from paying customs duties. While that purpose has long since vanished, displaying the unique yacht ensign has continued. Boaters sailing U.S. waters do not have to be concerned with flag display; in fact, flying an ensign of any type is not required. On the other hand, those planning foreign ports of call should know what flags to fly while underway in foreign waters, when making port, and where to fly the flags. The tips below about flag protocol and related issues are intended only as a guide; charterers should check with their representative and customs officials at a foreign port for details about quarantine, customs, immigration, and other issues. By law, the U.S. Yacht Ensign is not flown outside U.S. territorial waters and not used to identify vessel nationality in foreign waters or ports. The national ensign is almost always flown on the stern mast, with approved variations depending on vessel type (power cruiser or sailboat), length, and mast arrangement. Custom and tradition dictate that the national ensign be raised at 0800 local time and lowered at sunset. If other flags are to be flown on board, the national ensign is the first hoisted and the last lowered. The national ensign indicates the country of the vessel’s registration or documentation, not the nationality of the owner. When entering foreign waters or making initial entry into a foreign port, flying the yellow Quarantine (“Q”) flag is typically required until clearing customs. The “Q” flag signals that the vessel is requesting permission to enter port, that the boat is in good shape, and that all passengers are healthy. In theory, those on board should not disembark until the vessel and passengers have cleared the customs inspection. Prior to entering a foreign port, it is also prudent to contact the port authority or customs office via marine radio for directions. 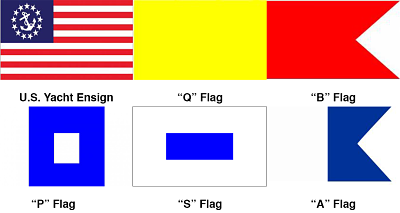 On sailboats, the “Q” flag should be flown on the starboard spreader. 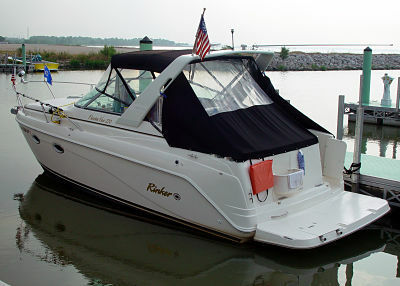 On powerboats with no mast, the flag can be displayed on or close to the bow. After clearing customs, the “Q” flag is replaced with the visited country's national ensign (called the courtesy flag). It is customary to fly the courtesy flag when operating in the waters of the visited country. The courtesy flag is hoisted at 0800 local time and lowered at sunset. While underway or maneuvering (for example, entering or leaving port), the courtesy flag is flown even at night, until the vessel is over the horizon or safely at dock. The foreign country courtesy flag is not flown after entering U.S. waters. In addition to ensign etiquette, understanding basic International Code of Signals (ICS) messages can also help avoid potential danger and provide hours of amusement during an extended voyage or a one-day trip. Modern day recreational boaters, professional mariners, and the world’s navies still use the ICS for several purposes, though the practice has greatly diminished in recreational boating and commercial shipping due to the widespread use of GPS, marine radios, and other technologies. The ICS is a global system of nautical communication rooted in ages-old tradition, custom, and courtesies. Its lineage can likely be traced to the Peloponnesian War, when the coordinated movement of hundreds of Athenian galleys would have required some sort of communication among the ships. Though no record exists to explain how the maneuvers were accomplished, flags would have been the most probable method. The signal code is used to communicate a variety of conditions or situations concerning the safety of navigation and persons or related matters. The system, which can be translated into nine languages, uses flags, each with a unique color, shape, and marking that represent each letter of the alphabet and the ten numerals. In addition to the letter it represents, each single flag or flag combination has a distinct meaning or code. For example, the “B” (Bravo) flag flown alone on a ship or barge communicates a very clear message: “I am taking on, discharging, or carrying dangerous cargo. Stand clear of my ship.” When the Bravo flag is flown with the “Z” (Zulu) flag, the meaning is entirely different: the combination sends a congratulatory (‘Well Done!’) message, usually seen on naval vessels. The sailing world also uses ICS code flags, but with entirely different meanings. For example, during regattas, the “P” (Papa or Blue Peter) flag is used as the “preparatory” flag, indicating the start of a race is imminent; the “S” (Sierra) flag indicates a shortened course, signifying that the race has been shortened due to weather or other conditions. A cruise ship or commercial vessel flying the “P” flag sends the message, “I am preparing to leave my berth.” Smaller boats in the area should keep well clear of a ship taking on fuel or preparing to depart. The most common signal flag boaters may encounter is the “A” (Alpha) flag. In U.S. and most foreign waters, the flag sends the message, “I have a diver down; keep well clear.” Boat operators in the area should give a vessel displaying the Alpha flag a wide berth. Naval vessels make the most use of ICS codes and, on special occasions, will dress the ship with the whole code flag alphabet set, from stem to stern, creating a very colorful display. For easy reference when underway, carry an ICS code flag chart on board that explains the messages. Even though many nautical customs and traditions have fallen into disuse, several still do serve a practical purpose, not the least of which is signaling a vessel’s country of registry and displaying patriotism. Understanding the basics of the world’s most recognized form of communication, the International Code of Signals, can make boating anywhere around the globe more interesting and more safe.